One of my first jobs back in March was to design a bedroom for Patty and she has finally finished decorating, using my concept and sample boards as inspiration. She was very excited so invited me over for a glass of wine and to take a few photos of the finished room. She is from Reunion, an island in the Indian Ocean, so she loves bright colours, vibrant patterns and rustic textures and she wanted to incorporate all these elements in the scheme. She had also recently bought a silver statue, which she wanted to incorporate into the design. Patty loves blue so I suggested a vibrant turquoise as the colour for the feature wall, with a very pale blue tone used on the other walls. The carving on the moroccan silver mirror reflects the carving on the statue- I think they both look really good against the blue. 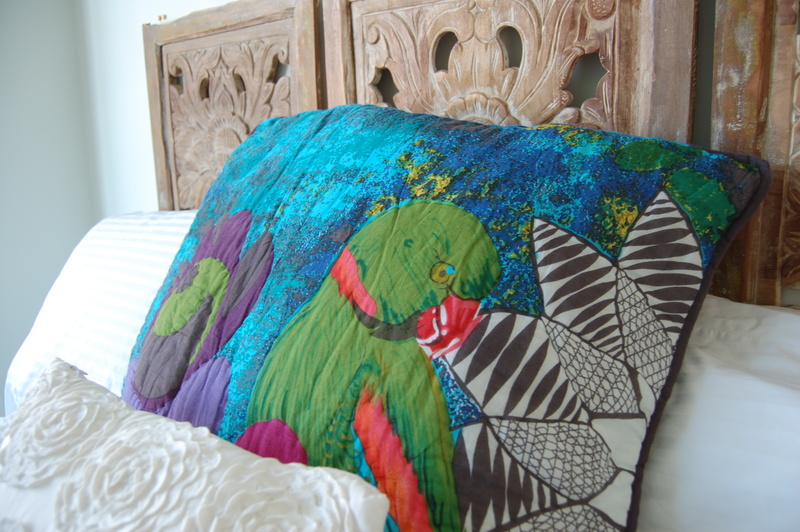 Patty splashed out on the quilt and cushion on the bed, which is a riot of colour and pattern. The turquoise of the feature wall is picked up in the background of the quilt and we kept the rest of the decor low-key so as not to overwhelm the whole scheme. Pattys headboard was inspired by antique Moroccan carved woodwork. We found these panels in an Indian furniture shop, which was closing down, so picked them up for a bargain price. The headboard cost about £60.00! The white cushion and throw contrasts with the vibrancy of the bedding. We chose simple wooden Venetian blinds as Pat wanted a cheap, practical window treatment. If you like Pattys bedroom and would like me to create a scheme for you, why not get get in touch. All you need to do is fill in the questionnaire which I will send you, send me rough measurements and some photos of your room and I will do the rest!